There was a time when Depeche Mode enjoyed the silence. There were no gun shots, no zombie growls, and no screams of horror when a Tank came onto the screen - but times have changed. 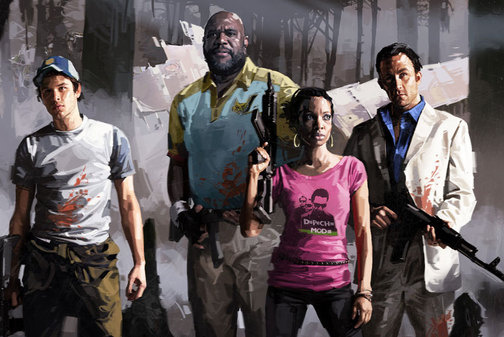 If you didn't notice, Rochelle, is sporting a pink Depeche Mode t-shirt in the above Left 4 Dead 2 character shot, and this is no accident. Chet Faliszek, co-lead and writer on Left 4 Dead 2, says that Valve solicited bands and record labels for the sequel, but Depeche Mode was one of the few who responded. Faliszek explaining to us at Comic-Con that the band was very free with letting Valve use its likeness, its audio recordings, and, obviously, its t-shirts in the game. Probably a smart marketing move, considering the band just launched an album and constantly reminding a few million Left 4 Dead players of the band's existence can't hurt. Perhaps we'll hear some music on background radios in the game, or maybe even some Depeche Mode zombies. They are pretty old, despite having a new album out this year. What do you guys think about it? Cheap marketing ploy or worthy addition to the universe?